What you need to understand about knives is that knives get dull in at least two different ways. Obviously a knife that is no longer sharp means that it is dull and can't cut properly but what you might not know is that if the blade gets out of alignment it also won't slice your foods properly. Here's where either the honing steel or the sharpening steel comes in. Honing Steel: A honing steel essentially works to align your knife by centering it properly and straightening it out. It doesn't shave off too much of the blade but it does correct the edge. The blade will seem sharpened because its positioned correctly but honing doesn't sharpen the knife. You should really hone your knife all the time, some professional chefs even hone every single time they use their knives! Sharpening Steel: Sharpening does actually sharpen the knife and leaves your knife with a lovely sharp edge. You can use a knife sharpener, whetstone, or waterstone to sharpen your knife. You should only have to sharpen your knife a few times a year. When your knife first gets dull, the first tool that you want to pull out of your arsenal is the honing steel. It's a maintenance tool and you can use it on a regular basis. The material of the steel is much harder than the edge of your knife. Watch the video above to see how Bob Kramer demonstrates using the honing steel or read our description below. 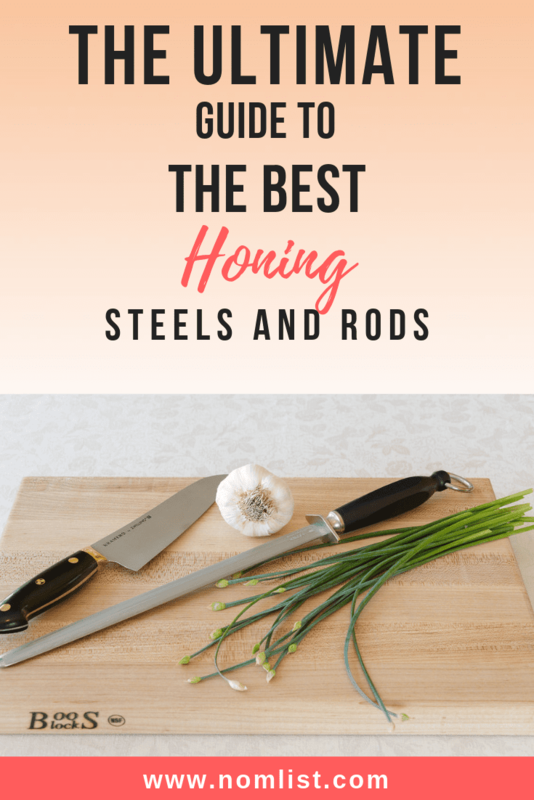 The way that we recommend using the honing steel is to put the steel straight down onto a cutting board and anchor it. Make sure that its secure. You're going to use a very slight angle, about the same angle as if you laid a matchbook up against the steel and then lay a knife against the matchbook. This is somewhere between 12 and 15 degrees. With the knife perpendicular to the honing steel and facing away from you, pull the knife towards you with a light but firm stroke. Generally people don't use enough pressure when honing a knife. What the honing steel is doing to your knife is straightening and aligning the edge. When you are done steeling your knife you should find that the edge is improved. Its not necessary to hone your knife every single time but you should definitely do it often. As soon as you detect that its not cutting as well, hone immediately! Wusthof is a long trusted name in the world of knives and it makes sense that their honing steel would be our best overall pick! This honing steel is more of an investment than the other rods on this list but we promise that it is worth it! It is made in the cutlery capital of Germany, in the city of Soligen and features high Carbon German steel. The ergonomic, contoured handles give you a secure grip that fits just right into your hand and the blade is compound tapered. The blade is super sharp and laser tested. The handle and the 440 stainless steel is what makes this honing rod stand out from other, less expensive Wusthof steels. This is the most durable of steels and is rust free. This easy to use honing steel will last you for many years and will sharpen your blade as it straightens it! The Messermeister Ceramic Rod gets the job done and is available in two lengths, 10 inches and 12 inches. It features industrial strength, ceramic steel and aligns your knife or provides maintenance to make sure your knife is always slicing and dicing to the best of its ability. Ceramic material is particularly awesome because it also sharpens as it aligns and this honing rod has an ergonomically designed handle which offers a soft and super secure grip. This rod is 1200 grit and is ideal for Japanese knives and everything in between. It also comes with a super convenient plastic sleeve to protect your rod in between uses. We love this awesome honing rod, it never wears out! The Green Elephant ceramic honing rod is available in 11 inches and features the highest grade of ceramic available ont he market. This honing rod will last you for years and is ideal for Japanese and German knives. It features Green Elephant's unique shock absorbing design which keeps your rod from breaking into tiny little pieces when dropped. It's extremely easy to use and features an ergonomic handle. We love that it also comes with a 30-day money back guarantee! This rod really creates a much cleaner, sharper edge than the metal honing rods out there in the market. You can use it on cheap knives, all the way up to the most high end of knives. This ceramic rod sharpens as it aligns and we love that! This 12 inch diamond honing steel from Ktoa Japan features diamond electoplating with an oval shape - which offers ultra efficient knife sharpening. It comes with an unconditional lifetime warranty featuring a sleek design and an ergonomic handle. This steel is light in the hand and works easily and smoothly. It's an ideal length and features a 1000 grit diamond. Just 3-4 strokes with light pressure can get your blade back to where you want it to be. Kota Japan is a high quality brand offering this steel at an affordable price. It features a patented bonding process and up to date technology in its design. Smith's 10 inch diamond honing rod features an oval design which offers more sharpening area than other designs. It features a rubber handle which offers a soft grip and a nifty little ring that allows you to hang up the rod nearby for easy access. The tip of steel is covered in plastic to protect your counter from the steel. This baby is pretty amazing, it features an interrupted edge which sharpens your knife with just a few strokes, it makes it razor sharp! The Smith's rod has a medium grit and features the ultimate in sharpening technology which realigning your edge. Its a high quality product from a trustworthy brand! This super high quality flat honing steel from F.Dicks is a total boss! It features a multicut, flat steel and melds seven steels all into one. There is a special ergonomic handle with a loop at the end for convenient hanging. This flat honing steel is ideal for grinding and for honing. Apply a strong pressure to grind and use a lighter pressure to hone the edges of your knife. This is an 11 inch steel and works great for both small and large and long knives. This is a steel that will last your a lifetime and professional chefs absolutely swear by it. It's definitely worth the investment for the precision work that it performs on your knives. It's the perfect length and width and we promise that you'll love it! This Victorinox honing steel is our top pick for the best smooth honing steel but it is also available in several other sizes and finishes. This particular choice is 10 inches and features a thin handle. Smooth steel is ideal for realigning your knife but aligning and straightening the bends at the edge of your knife to prevent you from having to sharpen your knife too often. Sharpening knives is not ideal because it actually removes metal from your blade and eventually files it down. Use this steel after each use for the optimal effects, its preventative maintenance. Smooth steels require a bit more extra work but will pay off with a finer edge for your knife. This one is our favorite pick! For the best of the best, look no further than this honing steel from Global. It comes in at 10 inches and hones and realigns your knife with its solid-core rod hones. It is coated wtih diamond particles and features chrome/vanadium stainless-steel. Its finished with hard chrome which protects the steel from abrasion and features a 3/4 inch oval design. The comfortable handle is dimpled which keeps it from falling out of your hand and gives you a solid grip. This Global honing steel is magnetic and is so powerful just a two strokes can get your knife razor sharp. You won't regret purchasing this honing steel, its well worth its investment!